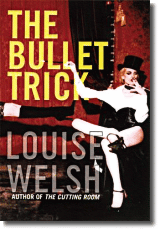 Campaign for the American Reader: "The Bullet Trick"
Last month I shared my enthusiasm for Louise Welsh's literary crime fiction. The Scotsman has since weighed in on the Glaswegian writer. Click here to go to a short item on January Magazine's "The Rap Sheet" blog. There you'll find links to the profile in The Scotsman as well to an "exclusive" excerpt from Welsh's new novel, The Bullet Trick.